← Can the Palestinian Authority become a good neighbor? 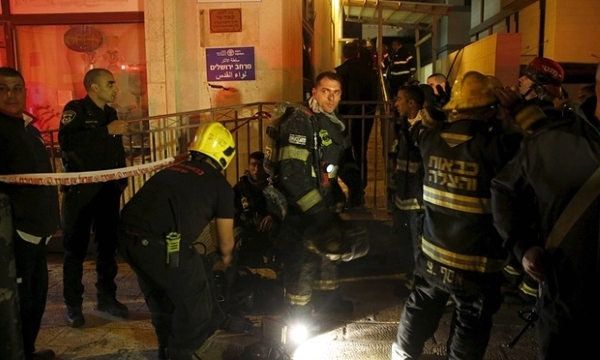 Last night a suspicious fire occurred at the offices of B’Tselem, an Israeli NGO concerned with “human rights in the occupied territories” (in other words, yet another foreign-funded operation working to delegitimize the Jewish state and sabotage its ability to defend itself). B’Tselem is probably one of the biggest such enterprises, receiving millions of dollars (2014 budget: about $2.4 million) a year from the European Union, European governments and the American New Israel Fund. On January 14, 2009, issued a press release “An Israeli Call for Urgent Humanitarian Action In Gaza,” accusing Israel of “grave violations of international humanitarian law,” “wanton use of lethal force,” and “disproportionate harm to civilians,” completely disregarding Israeli security concerns and Hamas’ indiscriminate terror attacks against Israeli civilians. In the past week, B’Tselem has been connected with a remarkably ugly affair, in which one of its activists, Nasser Nawaj’ah, an Arab from the village of Yatta near Hevron, worked with Ezra Nawi, a Jewish operative of another “anti-occupation” group called Ta’ayush, to inform the Palestinian Authority of Palestinians intending to sell land to Jews — a capital crime in the PA. PA security forces then tortured and killed them. Nawi was actually caught on videotape bragging about it. Ta’ayush, by the way, claims to be a group of “Israelis & Palestinians striving together to end the Israeli occupation and to achieve full civil equality through daily non-violent direct-action.” Apparently the land-dealer entrapment was an example of this cooperation. So there are many – Jews and Arabs among them – who will not shed a tear for this bunch of paid traitors who can now add murder to their accomplishments. I shouldn’t need to add that no responsible person, myself included, approves of arson (assuming this fire turns out to be deliberate) as a political act. I not only condemn it, I don’t even ‘understand’ it in any sense at all. But I do understand the need to do something to limit the activities of these foreign-funded anti-state groups. And that means that it is necessary to pass the transparency law that is presently before the Knesset. The law will require that representatives any organization that receives more than half of its funding from foreign governments must report their sources of funding, and must have this information on the identifying badges that they must wear when visiting the Knesset. It will also require that their reports and documents bear a notice with this information as well. Personally, I would like to see a much stronger law, one that would actually forbid foreign financing of these ‘activist’ groups. But that is unlikely. This law will not stop hostile nations from financing subversion in our country, but it will at least require that their agents and the material they distribute be identified as what they are. The European anti-Zionists are running scared, and even gave their agent, B’Tselem, 30,000 Euros in December to fight the bill. They claim somewhat surreally that transparency in funding is a “threat to democracy.” This implies that democracy would be served by foreign powers pumping huge amounts of money into a country in order to influence the decisions of its government, even when it means going against the wishes of its citizens! Some democracy. This entry was posted in Europe and Israel, Information war, Israeli Politics. Bookmark the permalink.